It is now illegal for anyone to smoke in vehicles with children present. The law was introduced in 2015 to help protect children from the dangers of secondhand smoke. Under the ban both the driver and the smoker can be fined £50 if anyone smokes in a vehicle with a person who is under 18. Newcastle University, Public Health England and Fresh conducted an experiment to highlight the dangers of exposure to secondhand smoke in vehicles. This tested the levels of dangerous chemicals (fine particles known as PM2.5) to which children can be exposed in the back seat of a car when a driver is smoking. When the windows were closed and the fan on, levels of chemicals were more than 200 times higher than safety guidelines. The amount of the poisonous gas Carbon Monoxide (CO) was two to three times higher than on a busy road at rush hour. 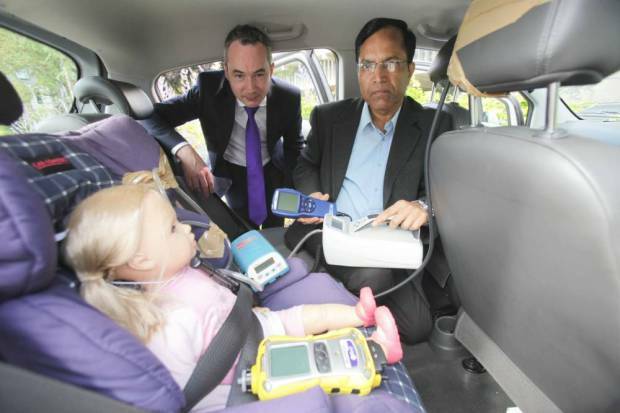 Newcastle University’s Dr Anil Namdeo, who heads up the Transport Research team, and who led the experiment, explains: “People think that by opening the window they are clearing the air, but what actually happens is the air is sucked in from outside and pushes the smoke backwards, straight towards the passengers in the back seat. Dr Malcolm Brodlie, (left) Clinical Senior Lecturer at Newcastle University and Honorary Consultant in Paediatric Respiratory Medicine at the Great North Children's Hospital, part of Newcastle Hospitals NHS Foundation Trust, said: "Breathing in secondhand smoke is harmful to anyone but children are especially vulnerable as their lungs are still developing. “We see the effects of this on hospital wards too often. Babies and children who breathe in smoke are more likely to have problems with asthma attacks and chest infections, and need more hospital care and doctors’ appointments.